"Tianshan" redirects here. For other uses, see Tianshan (disambiguation). The Tian Shan,[a] also known as the Tengri Tagh, meaning the Mountains of Heaven or the Heavenly Mountain, is a large system of mountain ranges located in Central Asia. The highest peak in the Tian Shan is Jengish Chokusu, at 7,439 metres (24,406 ft) high. Its lowest point is the Turpan Depression, which sits at 154 m (505 ft) below sea level. The Chinese name for Tian Shan may have been derived from the Xiongnu word Qilian (simplified Chinese: 祁连; traditional Chinese: 祁連; pinyin: Qí lián) – according to Tang commentator Yan Shigu, Qilian is the Xiongnu word for sky or heaven. Sima Qian in the Records of the Grand Historian mentioned Qilian in relation to the homeland of the Yuezhi, and the term is believed to refer to the Tian Shan rather than the Qilian Mountains 1,500 kilometres (930 mi) further east now known by this name. The Tannu-Ola mountains in Tuva has the same meaning in its name ("heaven/celestial mountains" or "god/spirit mountains"). Tian Shan is sacred in Tengrism, and its second-highest peak is known as Khan Tengri which may be translated as "Lord of the Spirits". Tian Shan is north and west of the Taklamakan Desert and directly north of the Tarim Basin in the border region of Kazakhstan, Kyrgyzstan, and Xinjiang in northwest China. In the south it links up with the Pamir Mountains and to north and east it meets the Altai Mountains of Mongolia. In Western cartography such as National Geographic, the eastern end of the Tian Shan is usually understood to be east of Ürümqi, with the range to the east of that city known as the Bogda Shan as part of the Tian Shan. Chinese cartography from the Han Dynasty to the present agrees, with the Tian Shan including the Bogda Shan and Barkol ranges. The Tian Shan are a part of the Himalayan orogenic belt, which was formed by the collision of the Indian and Eurasian plates in the Cenozoic era. They are one of the longest mountain ranges in Central Asia and stretch some 2,900 kilometres (1,800 mi) eastward from Tashkent in Uzbekistan. The highest peak in the Tian Shan is Jengish Chokusu (also called Victory Peak) on the border of China. At 7,439 metres (24,406 ft) high, it is the highest point in Kyrgyzstan. The Tian Shan's second highest peak, Khan Tengri (Lord of the Spirits), straddles the Kazakhstan-Kyrgyzstan border and at 7,010 metres (23,000 ft) is the highest point of Kazakhstan. Mountaineers class these as the two most northerly peaks over 7,000 metres (23,000 ft) in the world. The Torugart Pass, at 3,752 metres (12,310 ft), is located at the border between Kyrgyzstan and China's Xinjiang province. 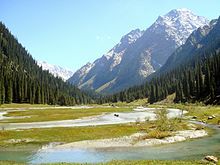 The forested Alatau ranges, which are at a lower altitude in the northern part of the Tian Shan, are inhabited by pastoral tribes that speak Turkic languages. 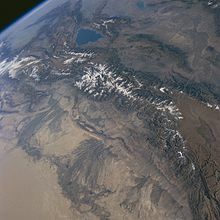 The Tian Shan are separated from the Tibetan Plateau by the Taklimakan Desert and the Tarim Basin to the south. Continuous permafrost is typically found in the Tian Shan starting at the elevation of about 3,500-3,700 m above the sea level. Discontinuous alpine permafrost usually occurs down to 2,700-3,300 m, but in certain locations, due to the peculiarity of the aspect and the microclimate, it can be found at elevations as low as 2,000 m.
One of the first Europeans to visit and the first to describe the Tian Shan in detail was the Russian explorer Peter Semenov, who did so in the 1850s. Glaciers in the Tian Shan Mountains have been rapidly shrinking and have lost 27%, or 5.4 billion tons annually, of its ice mass since 1961 compared to an average of 7% worldwide. It is estimated that by 2050 half of the remaining glaciers will have melted. The Tian Shan have a number of named ranges which are often mentioned separately (all distances are approximate). In China the Tian Shan starts north of Kumul City (Hami) with the U-shaped Barkol Mountains, from about 600 to 400 kilometres (370 to 250 mi) east of Ürümqi. Then the Bogda Shan (god mountains) run from 350 to 40 kilometres (217 to 25 mi) east of Ürümqi. Then there is a low area between Ürümqi and the Turfan Depression. The Borohoro Mountains start just south of Ürümqi and run west northwest 450 kilometres (280 mi) separating Dzungaria from the Ili River basin. Their north end abuts on the 200 kilometres (120 mi) Dzungarian Alatau which run east northeast along Sino-Kazakh border. They start 50 kilometres (31 mi) east of Taldykorgan in Kazakhstan and end at the Dzungarian Gate. The Dzungarian Alatau in the north, the Borohoro Mountains in the middle and the Ketmen Range in the south make a reversed Z or S, the northeast enclosing part of Dzungaria and the southwest enclosing the upper Ili valley. In Kyrgyzstan the main line of the Tian Shan continues as Narat Range from the base of the Borohoros west 570 kilometres (350 mi) to the point where China, Kazakhstan and Kyrgyzstan meet. Here is the highest part of the range – the Central Tian Shan, with Peak Pobeda (Kakshaal Too range) and Khan Tengri. West of this, the Tian Shan split into an ‘eye’, with Issyk Kul Lake in its center. The south side of the lake is the Terskey Alatau and the north side the Kyungey Ala-Too (shady and sunny Ala-Too). North of the Kyungey Ala-Too and parallel to it is the Trans-Ili Alatau in Kazakhstan just south of Almaty. West of the eye, the range continues 400 kilometres (250 mi) as the Kyrgyz Ala-Too, separating Chui Province from Naryn Oblast and then Kazakhstan from the Talas Province. This oblast is the upper valley of the Talas River, the south side of which is the 200 kilometres (120 mi) Talas Ala-Too Range ('Ala-too' is a Kirgiz spelling of Alatau). At the east end of the Talas Alatau the Suusamyr Too range runs southeast enclosing the Suusamyr Valley or plateau. As for the area south of the Fergana Valley there is a 800 kilometres (500 mi) group of mountains that curves west-southwest from south of Issyk Kul Lake separating the Tarim Basin from the Fergana Valley. The Fergana Range runs northeast towards the Talas Ala-Too and separaties the upper Naryn basin from Fergana proper. The southern side of these mountains merge into the Pamirs in Tajikistan (Alay Mountains and Trans-Alay Range). West of this is the Turkestan Range, which continues almost to Samarkand. On the north margin of the Tarim basin between the mountain chain of the Kokshaal-Tau in the south and that one of the Terskey Alatau in the north there stretches the 100 to 120 km wide Tian Shan plateau with its set up mountain landscape.The Kokshaal-Tau continues with an overall length of 570 km from W of Pik Dankowa (Dankov, 5986 m) up to east-north-east to Pik Pobedi (Tumor Feng, 7439 m) and beyond it. This mountain chain as well as that of the 300 km long parallel mountain chain of the Terskey Alatau and the Tian Shan plateau situated in between, during glacial times were covered by connected ice-stream-networks and a plateau glacier. Currently the interglacial remnant of this glaciation is formed by the only just 61 km long South Inylschek glacier. The outlet glacier tongues of the plateau glacier flowed to the north as far as down to Lake Issyk Kul (Lake) at 1605 (1609) m asl calving in this 160 km long lake. In the same way strongly glaciated was the in excess of 50 km wide high mountain area of the Kungey Alatau connected north of Issyk Kul and stretching as far as the mountain foreland near Alma Ata. The Kungey Alatau is 230 km long. Down from the Kungey Alatau the glacial glaciers also calved into the Issyk Kul lake.Its Chon-Kemin valley was glaciated up to its inflow into the Chu valley. From the west-elongation of the Kungey Alatau –that is the Kirgizskiy Alatau range (42°25’N/74° - 75°E) - the glacial glaciers flowed down as far as into the mountain foreland down to 900 m asl (close to the town Bishkek). Among others the Ak-Sai valley glacier has developed there a mountain foreland glacier. The Tian Shan holds important forests of Schrenk's Spruce (Picea schrenkiana) at altitudes of over 2,000 metres (6,600 ft); the lower slopes have unique natural forests of wild walnuts and apples. The Tian Shan in its immediate geological past, was kept from glaciation due to the "protecting" warming influence of the Indian Ocean monsoon climate. It defined its ecological features, acting as a region that could sustain a distinctive type of ecosphere. The mountains were faced to constant geological changes, disturbing drainage systems, patterns of vegetation, as well as exposing fertile soil for coming seedlings to be exploited. Ancestors of thousands of plants and important crops mobilized in the area, among them the ancestor of the sweet apple that would later develop into apricots (Prunus armeniaca), pears (Pyrus spp. ), pomegranates (Punica granatum), figs (Ficus), cherries (Prunus avium) and mulberries (Morus). The area expanding the Tian Shan was an arena of exchange, including animals like bear, deer and wild boar. In Chinese traditional religion and Daoism, Tian Shan is associated to God, Tian itself. It is also regarded as the location of the peach tree of immortality wardened by Xiwangmu, the Queen Mother of the West. In Tengrism, Khan Tengri is the lord of all spirits and the religion's supreme deity, and it is the name given to the second highest peak of Tian Shan. At the 2013 Conference on World Heritage, the eastern portion of Tian Shan in western China's Xinjiang Region was listed as a World Heritage Site. The western portion in Kazakhstan, Kyrgyzstan, and Uzbekistan was then listed in 2016. ^ a b c Scheffel, Richard L.; Wernet, Susan J., eds. (1980). Natural Wonders of the World. United States of America: Reader's Digest Association, Inc. p. 378. ISBN 978-0-89577-087-5. ^ Mallory, J. P. & Mair, Victor H. (2000). The Tarim Mummies: Ancient China and the Mystery of the Earliest Peoples from the West. Thames & Hudson. London. p. 58. ISBN 978-0-500-05101-6. ^ a b Wilkinson, Philip (2 October 2003). Myths and Legends. Stacey International. p. 163. ISBN 978-1900988612. ^ Naik, Gautam (August 17, 2015). "Central Asia Mountain Range Has Lost a Quarter of Ice Mass in 50 Years, Study Says". Wall Street Journal. Retrieved August 18, 2015. ^ a b c Kuhle, M. (1994): New Findings on the Ice-cover between Issyk-Kul and K2 (Tian Shan, Karakorum) during the Last Glaciation. Proceedings of the International Symposium on the Karakorum and Kunlun Mountains (ISKKM), Kashi, China, June 1992. (Eds: Zheng Du; Zhang Qingsong; Pan Yusheng) China Meteorological Press, Beijing, 185-197. 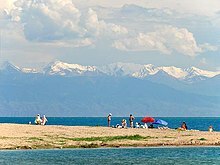 ^ Grosswald, M. G., Kuhle, M., Fastook, J. L., (1994): Würm Glaciation of Lake Issyk-Kul Area, Tian Shan Mts. : A Case Study in Glacial History of Central Asia. Kuhle, M. (Ed.). Tibet and High Asia. Results of the Sino-German and Russian-German Joint Expeditions (III). GeoJournal, 33, (2/3), Dordrecht, Boston, London, Kluwer, pp. 273-310. ^ a b Kuhle, M. (2004): The High Glacial (Last Ice Age and LGM) glacier cover in High- and Central Asia. Accompanying text to the mapwork in hand with detailed references to the literature of the underlying empirical investigations. Ehlers, J., Gibbard, P. L. (Eds.). Extent and Chronology of Glaciations, Vol. 3 (Latin America, Asia, Africa, Australia, Antarctica). Amsterdam, Elsevier B.V., pp. 175-199. 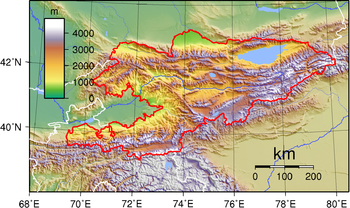 ^ Kuhle, M. & Schröder, N. (2000): New Investigations and Results on the Maximum Glaciation of the Kirgisen Shan and Tian Shan Plateau between Kokshaal Tau and Terskey Alatau. Zech, W. (Ed.). Pamir and Tian Shan. Contribution of the Quaternary History. International Workshop at the University of Bayreuth. Abstracts. Bayreuth, University Bayreuth, p. 8. ^ "Western Tien-Shan". UNESCO World Heritage Centre. United Nations Educational, Scientific and Cultural Organization. Retrieved 17 July 2016. Wikimedia Commons has media related to Tian Shan.